Christine Valters Paintner and Betsey Beckman hold advanced degrees, are professional artists and authors, plus are co-founders and directors of a program called Awakening the Creative Spirit: Experiential Education for Spiritual Directors, offered each year on the beautiful Hood Canal in the Pacific Northwest. - Publisher The new resource is designed to help spiritual directors and others use expressive arts in the context of spiritual direction. It is the latest book in the unique SDI series, designed for professional spiritual directors, but also useful for clergy, therapists, and Christian formation specialists. 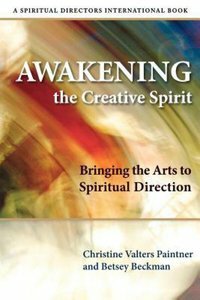 About "Awakening the Creative Spirit"
The new resource is designed to help spiritual directors and others use expressive arts in the context of spiritual direction. It is the latest book in the unique SDI series, designed for professional spiritual directors, but also useful for clergy, therapists, and Christian formation specialists. Beckman, dancer and choreographer, has been acclaimed as one of the finest liturgical dancers in the country. As movement therapist, mother, writer, and dancer, she dedicates her life and work to reclaiming and celebrating the body as sacred.